In lieu of a news roundup from last week (as I didn’t get a chance to take any photographs! ), here is something much more interesting! Matt Ellis, the Keeper of Transport, has been working through the archive of tramway logs and compiling the mileages for the tramcars over this period. Previously we have recorded the days in use rather than miles covered, but as Matt explains, with the varying traffic patterns now, then a mileage is a useful tool for the maintenance team to have in their planning. As is very clear from the results, the mileages have increased considerably, attributed to our longer season, increased operation and number of passengers needing to be carried plus the add-on activities such as evening events and tramcar driving experiences. Clearly there is a knock-on effect and the maintenance challenges are regularly recorded here. 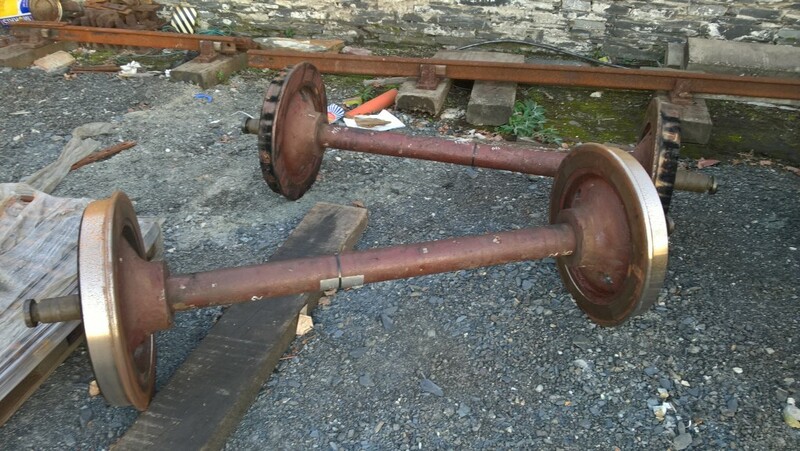 We are also seeing the work needed to overhaul tramcars now developing into extensive engineering – Gateshead 10 has long used up any ‘life’ left from its Gateshead days (and certainly since its BR days, who in turn had made the most of whatever was left when they purchased the car in 1951). 10 will become one of our biggest in-house engineering projects ever, and much work is underway behind the scenes on this project now. Each day the tramway supervisor fills in a diary logging which trams have been running and with which crew. These diaries are archived and go back to the mid 1990’s. A tram in service all day will do around 25 miles, based on approximately 16/17 laps, and dead mileage from the entrance to depot. We are in the process of working out a mileage between overhauls; this will allow us to better predict when a trams next overhaul will need to be. The historic records will give an indication of what this figure has been for the tramcars which have been overhauled numerous times over this period, Gateshead 10 being a good example. The historic records have been inputted into a spreadsheet, going back to 2002 (so far). This has revealed some interesting figures which blog readers may be interested in. These are best quoted as “educated estimates” rather than exact figures. Where a tram was in service all day it is entered as a full 25 miles. Where a tram ran off for lunch breaks it is counted as a half day. The average number of circuits balances out over the year. In winter when there are less trams on the circuit and less visitors getting on and off then 20 circuits can easily be achieved in a day. In summer when there are normally 3 or 4 trams on the circuit and full loads of passengers loading and unloading then each circuit takes longer and 14 or 15 circuits is more normal expectation. 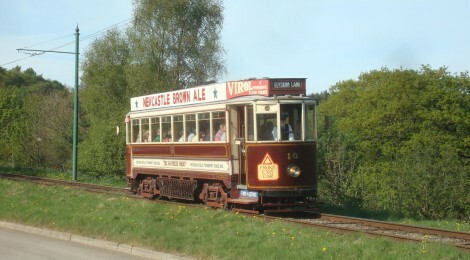 The mileages quoted do not include mileage done by a tramcar on loan from Beamish such as 31 in Blackpool. So the headline figure, all trams, including visitors have from 2002 until now done 298,550 miles, so that’s 12 times around the earth. Mileages per year have been steadily creeping up; in 2002 the total mileage for the year was 17,625. In 2016 this figure has already been passed and in October we are already at 20,875. 2015 total was 25,475. In 2002 five operational tram cars did the total mileage, in 2016 this isn’t any different but each car is doing its share of the extra mileage. Visiting tram cars to Beamish have in total done 16,900 miles, obviously the longer term visitors have done most of this. Gateshead 10 and Sunderland 16 regularly do the highest mileage in a year, with 10 having done this seven times and 16 having done this four times. The exceptions are 2003 (Blackpool 31), 2013 (Sunderland 101/Blackpool 703) and 2014 (South Shields 196). Hopefully blog readers will find this information interesting. We will keep this record up to date but as you can see the fleet will achieve 300,000 miles before the end of the year, not bad going for circuit around 1.5 miles and a small fleet of trams. Our tram cars must be some of the highest mileage heritage tramcars in the world. At the current rate the fleet will see its 500,000th Mile sometime in 2023, though really it has probably already been achieved since the tramway opened in 1973. 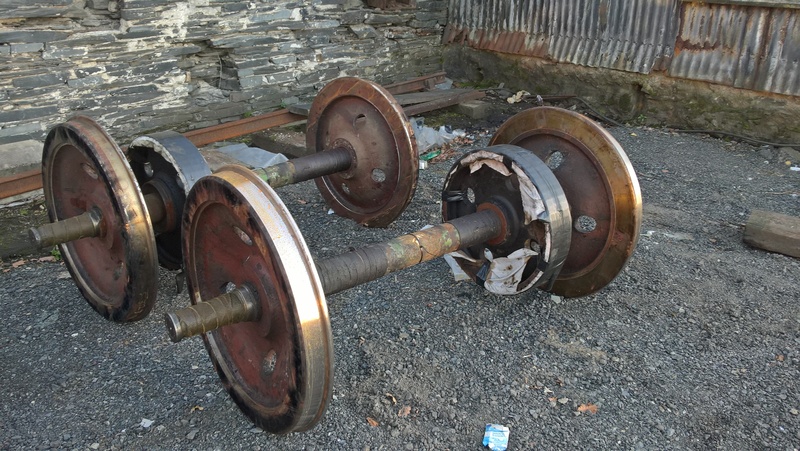 Below: These photographs show Gateshead 10’s wheelsets, newly re-tyred and machined at the Ffestiniog Railway’s Boston Lodge workshops. In both photos one wheelset can be seen with burn marks evident on the tyre-tread. This is where the wheel centres were in sound condition for the tyres to be fitted perfectly concentric and square to the axle. This means the rolled tread is suitable to run on, as delivered. The shiny tyre treads show where the re-tyred wheel has had a light skim in the lathe to restore a concentric and square result. The burn marks are caused by the gas jets used to expand the tyre in readiness for shrinking onto the wheel centre. This has probably been mentioned before, however there is one question I would like to ask: When do you hope Gateshead 10 will be ready to return to service? Hi Richard – no formal date for completion announced now that we are gaining an insight into the extent of the work required. We haven’t looked at the body yet either! Hopefully it will be done for around this time next year but it really depends on what else comes along in the meantime. Glad you enjoy the blog! Noted steam loco “Vulcan” working at York NRM today (27th Oct). On it’s way back to Barrow Hill, I wonder? Whilst Power from the Past 5th/6th Nov. is road themed, will “Bon Accord” be working at the colliery and the ‘Peckett’ at Rowley? There’s nowt like a bit of autumnal steam! Very interesting and thanks for sharing. I’d love to know the mileages of the individual visitors too! I’ve always said that the Beamish fleet works hard – almost equivalent to what Blackpool oncve did! Certainly they do a bit more than some our Blackpool heritage fleet. I think 31 has had a nice rest by the sea this yer.